Whether you hit the water or the water hits you the Torpedo Watch by Momentum will keep you covered. As dive watches have evolved the styles and functions have evolved with them, sometimes simplicity is best though so that’s why we designed the Torpedo with substance and style! Today, watches come in all shapes and size, for all types of applications: sports, luxury, fashion… the list goes on. With so many options and purposes, how does one choose what is right for him? Especially when it comes to choosing a rugged sports watch for daily use? 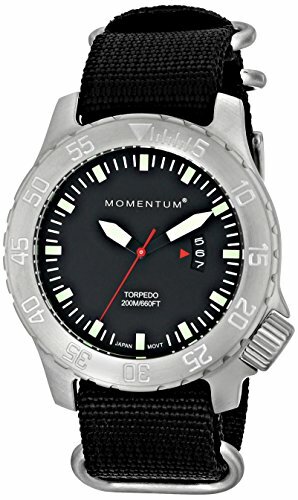 Fret not, because Torpedo Dive Watch by Momentum is here! We created this rugged timepiece that has a solid construction, high waterproof rating, and a classic timeless design, all at a budget-friendly price! Packed with a whole bunch of features, this watch is an absolute power-house. Here are a few reasons why this watch is worthy of your wrists? ● To ensure strong characteristics, all Torpedo Dive watches are machined from a block of solid stainless steel. ● The watch also comes with a tough and versatile 22MM diving grade band which makes it completely water resistant! ● The watch also houses a 44mm stainless steel open dial with a date window and comes waterproof-tested up to 200M / 660FT. With all this said, would you still rather buy 5 different time-pieces that serve 5 different purposes and burn a hole in your pocket? Or would you buy the ultra-tough Torpedo watch by Momentum and rock it on your wrists. Make the right choice. Grab this timepiece by adding it to your basket TODAY! RUGGED DESIGN: This is our ultra-tough budget dive watch. This watch case is loaded with features that make it perfect for you! WATERPROOF PERFORMANCE: These waterproof watches for men are tested up to 200M / 660FT, making them perfectly suitable as a daily watch. Swimming or scuba diving? This watch can handle it all! DURABLE ON YOUR WRIST: These wrist watches for men come with diving grade bands that features solid hardware & a heavy-duty steel clasp. The band is tough, versatile & perfect for an active lifestyle. IDEAL GIFT: The Torpedo makes for a great gift watch - whether it's a birthday, an anniversary or a special occasion. It's sure to make the receiver of this outdoor sports watch very happy. If you have any questions about this product by Momentum, contact us by completing and submitting the form below. If you are looking for a specif part number, please include it with your message.